Diversity is about human relationships! People at all levels in organisations who seek to find more constructive ways of interacting with people perceived to be different to them. - Participant's becoming excited by diversity and gaining the skills to explore differences in ways the build sustainable cross-cultural understanding and relationships. - Improving participant's understanding of communication, team work, conflict resolution, leadership and embracing diversity. - Raising awareness and understanding of the impact of improved communication in the workplace, to enhance relationships based on respect, trust and collaboration. 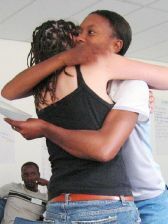 - Developing participant's skills in effective communication with different people. - Building positive team-enhancing practices which contribute to interpersonal co-operation and supportive working relationships. - Exploring the process of change and development in individuals and groups and its effect on relationships. - Identifying organisationally entrenched practices that may be perceived as supporting negative interpersonal behaviours that impact negatively on productivity and profitability. Carefully balanced teams of 3 or 4 facilitators who have the appropriate experience. 16 hours over consecutive days. "A very good and interesting way to start knocking down those walls and building relationships"
"Excellent" "Good structure in allowing the group to participate and learn"